Starting at the bottom cuff, these fingerless mitts are worked flat in a rectangular shape while adding in several different texture stitches. The rectangle is seamed up the side leaving an opening for the thumb. Not only are the finished mitts cute and stylish, they will teach many important knitting skills along the way. 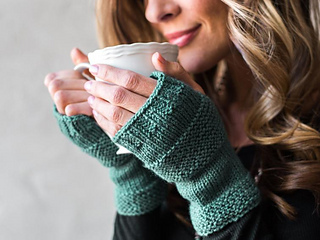 The fingerless mitts are the perfect starting point for any beginner!